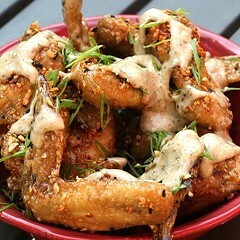 I need to begin this review with an apology. In the January edition of the Reader's semiannual list of books to look forward to, I included Dr. Eleanor's Book of Common Ants of Chicago with the explanation "Because forewarned is forearmed." I thought I was being witty. Now that I've actually read Dr. Eleanor's Book of Common Ants of Chicago, I realize how painfully naive and prejudiced I was. 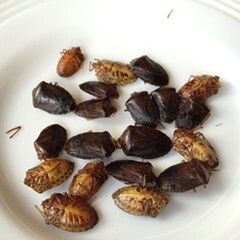 So I'm sorry, ants of the world, for underestimating you all and assuming you were pests. Now I know you're remarkable creatures of dazzling strength and ingenuity, even the rare species who pester humans (fewer than 30 of the 1000 who live in North America), and that our world would be a much sadder place without you. This change of heart is due entirely to the enthusiasm of Dr. Eleanor, aka Eleanor Spicer Rice, an entomologist who has a deep love and admiration for ants. "Odds are you can see these ladies tiptoeing all around you," she writes in her introduction. "See how beautiful they are, with their spines and ridges, their colors and proud legs, each feature lending itself to the individual's task. 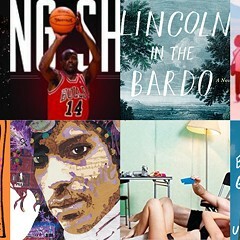 See their work, how they help build the world around us as they move about our lives." In 12 short essays, illustrated by Alex Wild's close-up photos of ants, Spicer Rice describes 12 different ant species that can be found in and around Chicago, the most familiar of which are the enormous carpenter ants who live in trees, the pavement ants who wage vicious wars for territory on the sidewalk, and the odorous house ants who sometimes hang out in your kitchen (if you have them, Spicer Rice envies you greatly because they are loads and loads of fun to watch). You may have also seen or at least experienced the work of the amazing winnow ant, which chews the covers off seeds and then replants them far from their parent plants so they have a better chance of growing up. But it turns out there's a whole subterranean world of ants and other tiny insects! Amazon ants have a nasty habit of kidnapping and enslaving field ants to work in their colonies. Tiny, blind trap-jaw ants hunt odd little not-quite-insects called springtails; the fascinating part is that the trap-jaw ants can only capture prey that get close enough to trigger the little hairs between the ant's jaws that snap them shut. Winter ants build underground colonies that can extend nearly 12 feet down, the equivalent, Spicer Rice writes, of second-graders digging a mile-deep tunnel. The winter ants also store their food reserves in their gasters, or rear ends, which gives them a pretty spectacular silhouette. Winter ants feeding their sisters. Almost none of these ants, it's true, are specific only to Chicago. Much of the material in the book has been repurposed from Spicer Rice's other books, most notably Dr. Eleanor's Book of Common Ants. (There are also volumes for California and New York City.) There's one exception, however: Stenamma, which Spicer Rice has nicknamed the hobbit ant in honor of its furry body and its habit of building cozy little homes for itself in holes in the ground. The hobbit ant was first identified by Mary Talbot, an entomologist who tirelessly explored Chicago's ant underground in the 20s and 30s and who eventually discovered 90 unique species before moving on to an academic job in Saint Louis. 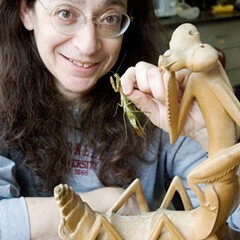 Her work formed the foundation for later studies of ants and ant society, from which humans have gained valuable insights about, among other things, medicine, engineering, and computer data transmission. Dr. Eleanor's Book of Common Ants of Chicago begins with two tributes to Talbot, one in Rob Dunn's introduction, and another in Spicer Rice's essay about hobbit ants. 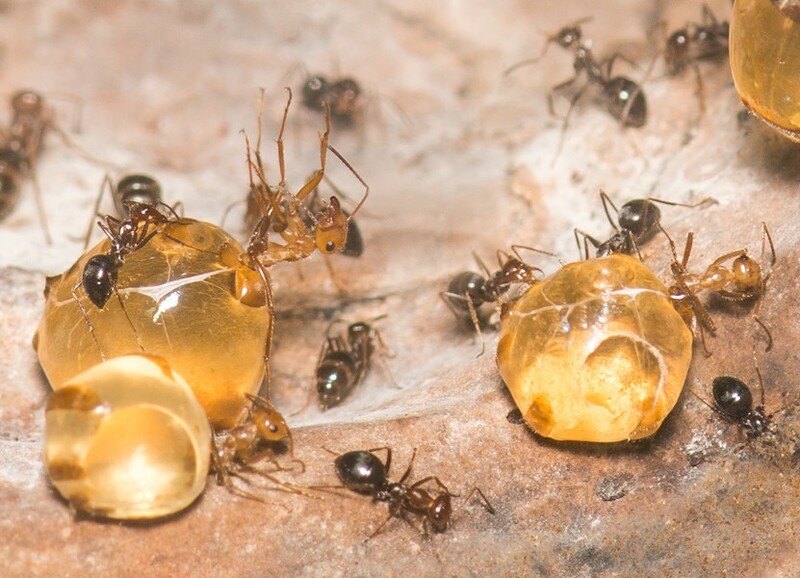 There is apparently a renaissance going on in Chicago ant studies right now: Corrie Moreau of the Field Museum and Sean Menke at Lake Forest College have been conducting studies of local ant life. Other Chicagoans are participating in the School of Ants, a large crowdsourcing project that encourages citizen-scientists to go out and identify as many ants as they can. 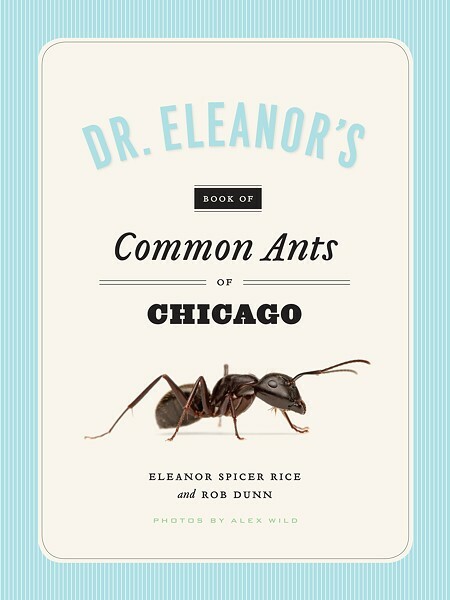 Dr. Eleanor's Book of Common Ants of Chicago is a lovely introduction to the world of ants and ant research. Spicer Rice's writing is descriptive and accessible, and she consistently emphasizes how much is still unknown about ant life (no one, for instance, is quite sure of what male ants do besides mate with queens) and how much you can learn simply by watching a colony at work. I'm tempted now to put some honey on an index card and take it outside to see what turns up. 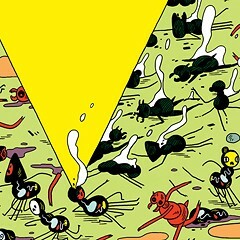 The indie comic artist's graphic novel depicts a chatty, grotesque, anthropomorphic Ant Colony.